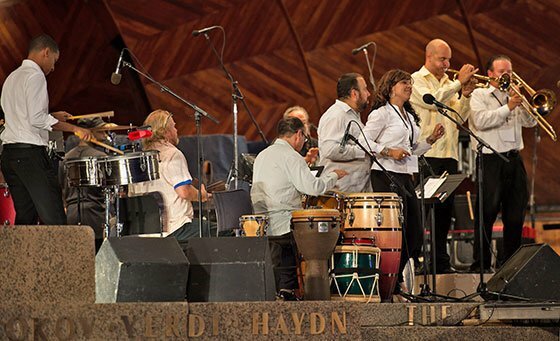 On a perfect Wednesday night at the Hatch Shell, The Boston Landmarks Orchestra, music director Christopher Wilkins, presented “Fiesta sinfónica: A Night at the Tropics,” a Latin- and jazz-inspired evening of works spanning more than a century and a half. The first half of the program featured the Orchestra and four composers Louis Moreau Gottschalk’s, Symphony No. 1, Un Noche en los Tropicos, Part 2, “Festa Criolla;” Heitor Villa-Lobos’s The Little Train of the Brazilian Countryman from the Bachianas brasileiras No. 2; José Pablo Mancoya’s Huapongo, and Boston’s own Thomas Oboe Lee’s Mambo! After intermission, the orchestra was joined by Alex Alvear’s Salsa Orchestra, as well as by dancers from Bajucol, Colombian Folkloric Dance Group (Miguel Argas, Director), and the South End Showstopperz youth dancers, in a single work, Gonzalo Grau’s Viaje (Voyage) Afro-Carribean Suite for Symphony Orchestra, Latin Combo and Soloists (Gonzalo Grau), but we were to be treated to more. The event was presented in partnership with Inquilinos Boriculas e Acción (IBA). Wilkins set a festive tone for the evening, launching into the Gottschalk without preamble, but with plenty of gusto and rhythmic flair—full of life. He was often up on toes, almost dancing, articulating his gestures not just to the orchestra but to those seated more than a hundred yards back on ground, appropriate for this outdoor program. Who needs binoculars, anyway? It was clean, clear, crisp, and colorful, in no small part to the expanded percussion section, with maracas and much more. And while this was no small ensemble, the premiere of the work in Havana in 1859 included more than 650 performers! A snappy, fugal development section led to what sounded like a lot of traffic whistles. Traffic whistles in 1859? But then, to paraphrase Wilkins after the piece, Gottchalk wrote this work way before any Western immersion into jazz.. This was the 3rd week in a row to feature a Boston area composer at a Landmarks event, this time, Thomas Oboe Lee’s “Mambo!” which followed, a work written for founder Charles Ansbacher and the orchestra in 2003. Triangles and claves set the rhythm and tone of the work. The orchestration also included piano. The music sounded to me as if right out of the 60’s, the 1960’s that is, and in that it seemed only about a decade newer than the Gottchalk. Lounge music at its best, Lee’s “Mambo” is ultra-accessible and intentionally so. Much color, and so fun to hear, a driving syncopated rhythm propelling the piece up to the final “Mambo!” recited by full orchestra and conductor-turned-to-audience. Wilkins introduced the Villa Lobos, stressing a history collaboration of folkloric music with symphonic orchestras in this country. But he was really speaking to the 8-year-olds in the audience, letting them know that they were about to be treated to a catalog of train sounds, from hissing steam to much more. He might of added—but didn’t need to since we had the orchestra as our mode of transport under this conductor—that there would be Doppler effects, big brass and a barrage of percussion making sounds of metal (fitting), bells, blasts, sounds of acceleration through inertia (no small feat), and flutes becoming brakes on wheels to bring this not-so-little train to its destination. So many whistles. In the end, all sounding quite wistful. Huapango is filled with masterful touches. In the beginning, Indian percussion – or their modern descendants – emerge from a rhythmic mist that coalesces into a driving accompaniment against which the main theme evokes the whoops and hollers of dancers. Floor-pounding rhythms alternate in groups of twos and threes, the characteristic pattern of a huapango. Harp and xylophone glissandos suggest the swirl of women’s dresses. In a middle section full of sweetness, a solo harp echoes the folk harp of Veracruz. A contest erupts between two male dancers (trumpet and trombone) leading to a final phrase thundering with reverberations of the original rhythmic mist. Working with elements of folk music, most composers appropriate whatever is most compatible with orchestra convention and leave the rest alone. It is a case of “adaptive reuse.” Mr. Grau’s goal was to present each popular tradition in its pure form, weaving the original type into the orchestra fabric. The various styles are in dialogue with one another. 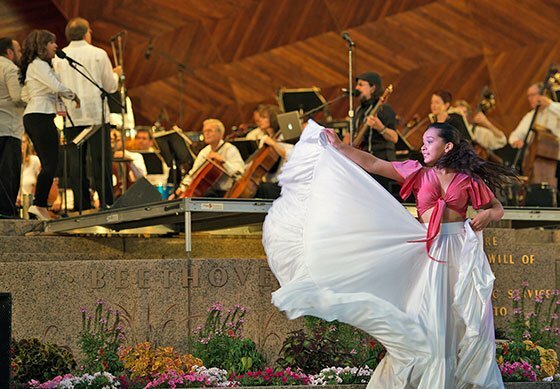 The whole approach in inventive and fresh, and perfectly in harmony with the Boston Landmarks Orchestra’s mission to encourage inclusiveness and a joyful spirit of collaboration. Our notes also served as a guide through Grau’s Viaje (Voyage) Afro-Carribean Suite for Symphony Orchestra, Latin Combo and Soloists. And quite a voyage it was, beginning with music derived from Santería religious chant, winding its way through the European dance hall, Afro-Cuban folkloric street music, the slowest of the Cuban rumbas, more mambo, Afro-Columbian music of the Pacific. All this and more by way of Cuba, before a tour of Columbia—African-derived courtship dance from the Caribbean coast—and then the Dominican Republic, including music derived from Spanish, Native, and African peasant music, songs telling the news of the day, and music based on the song, “Compadre Pedro Juan.” Interestingly, the number of countries represented by players in the Salsa orchestra these countries and more: Columbia, Costa Rica, Cuba, Dominican Republic, Ecuador, Sweden, and the USA. Piano enters. Some spoken word. Beautiful duo singing between and solo dancer becomes a couple. Off-sync clapping from the audience (to be expected). “Mambo!” is announced. Brass break loose. Tons of wild percussion. An entire dance troupe on stage now and for the rest of the piece. Later, a stratospheric clarinet melody, extended, piercing (in a good way). Marimba playing. A feast of sounds, rhythm, song, spoken word, and dance, under the persuasive baton of Wilkins. But to top it off (so to speak), as the piece wound its way towards closure we hear the full orchestra plus salsa orchestra, all supported by Alex Alvear’s progressively emerging and compelling amplified-electric bass playing. It worked beautifully. Finally, a tender harp solo, the music builds. Climax. Done. I don’t think the audience was quite ready for it to be over. What started as warm applause, though, did gradually grow as players and soloists were acknowledged. But we weren’t through. Wilkins announced that he and the orchestra would descend to the dance floor, where we were all invited, while Alvear’s Salsa Orchestra would continue with a short “descarda,” a Cuban jam session. Within a couple minutes a couple hundred from the audience were up and dancing. One shouldn’t be greedy with encores, I suppose, but it was over too soon. Better to crave a bit more than leave fully satiated. Had this been a feast of a different kind, we’d have had food in just about every color in the garden, with lots of spice. After the concert, still in a Fiesta sinfónica state of mind, I made my own little fusion of flavors and color. A little western roast duck, shredded, with a spicy latin salsa, with mango, chile, avocado, cilantro and spice. A strong margarita, shaken (sadly, that’s about as close to dancing as I get). Mmm….almost as satisfying as the music in the Hatch Shell. Meanwhile, musicians and guests were off to Kika’s in Cambridge for tapas (including, I wonder, ceviche in a hatch—I mean half—shell?) as well as strong drinks, and, one might hope, several deserved toasts to each other.